After nearly 20 years of providing flagship services and design to gardens and landscapes in Northern Michigan, we answered the call to make our unusual plants, delightful pots and high energy, creative design services available to everyone. We opened our small oasis of wonder in what can only be described as an area of fervent industry. Located on M-119, directly across from the Harbor Springs Airport runway, next to a terrific local brick business (Emmet Brick & Block) and adjacent to a multi-faceted business park, we are set back from the road frontage and cannot even attract with color. 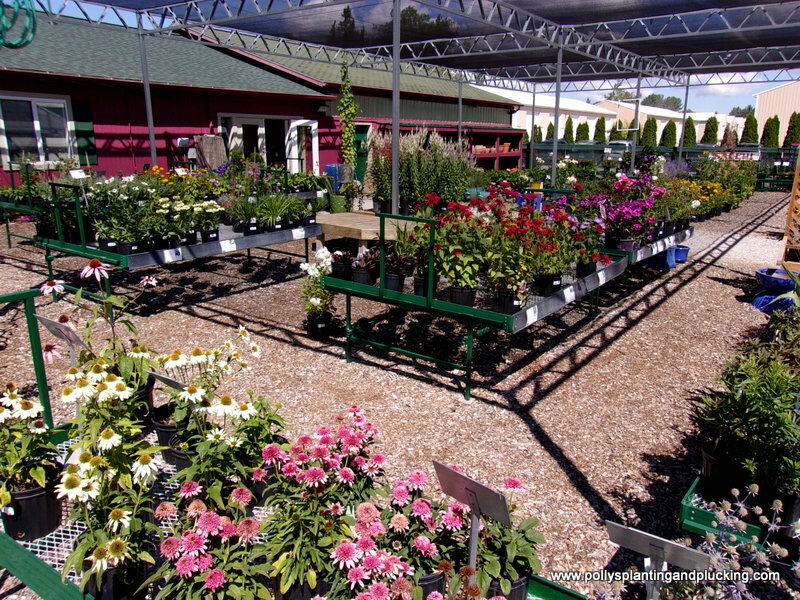 All that has not stopped us from creating a first class nursery that offers the greatest selection of time tested, garden-worthy plants for your needs. We have collected distinctive pottery, gift ideas and fresh cut flowers to complete your ultimate experience. Open from “snowmelt” to Christmas, we have new plans, new seminars, new specialty showcases and more. Think of your events and come see how Polly’s can make it wonderful, memorable and, most of all, EASIER! Be sure to follow our Facebook page for the most current updates.